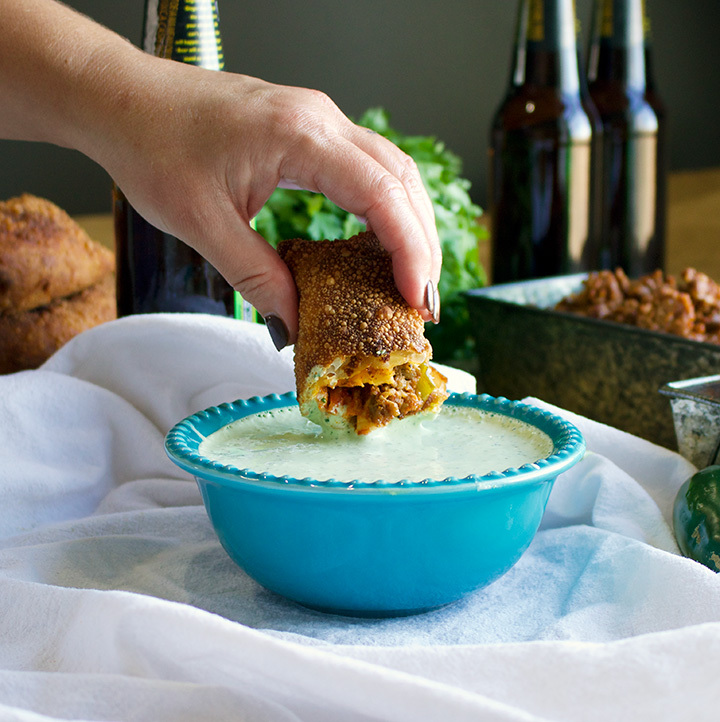 Cheesy Chili Rellenos with Paprika Chicken, Chorizo, and Jalapeño Cream. 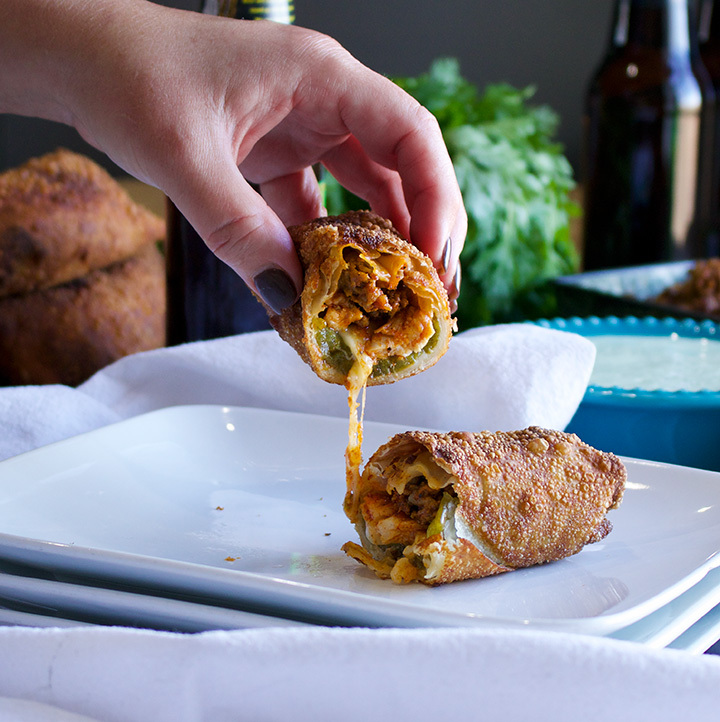 Layers of green chilies, roasted paprika chicken, chorizo, and sharp white cheddar cheese are wrapped inside a double layer of egg roll wrappers, fried until golden on the outside, and cheesy on the inside. Served with jalapeño cream sauce for dipping. This is the type of dish that, if I saw it listed in the appetizer section of a restaurant, I would order as my meal so that I could eat more than one and not have to share. Green chilies, roasted paprika chicken, chorizo sausage, sharp cheddar cheese, all wrapped in egg roll wrappers and fried until the cheese is melted and the outside is gorgeously crispy. There’s a whole lotta flavor going on in there. 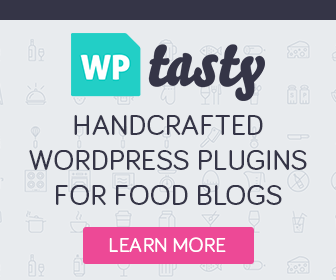 Serve them at a party – or serve them for dinner and dinner becomes a party. Especially if margaritas are involved. Or beer. 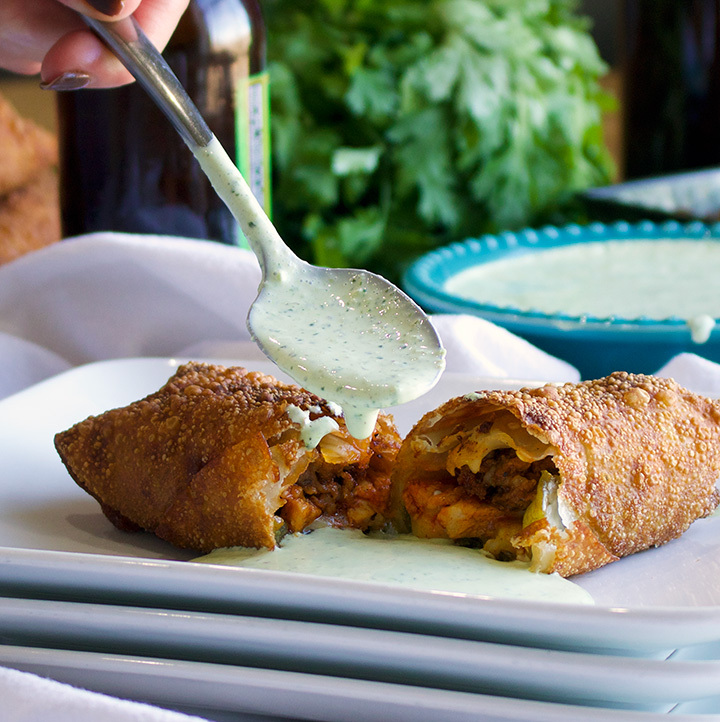 We have chili rellenos fairly often at our house because egg roll wrappers exist. Well, ok. We have them a lot because we really, really love them. But, I wouldn’t make them nearly as often (if ever) if it weren’t for egg roll wrappers. Not only do they give chili rellenos a super crispy exterior (which is how we like them), they hold in all sorts of delicious ingredients. Usually I make chili rellenos when I’ve already made a big pot of Green Chili for something like Burritos. That crispy outer shell, melted cheesy interior, smothered under spicy green chili is just the BEST. Except, I don’t know that I can say that anymore because this version might be even better. Start by roasting a pan of chicken thighs that have been coated in a thick layer of smoked paprika. Cook some chorizo sausage and grate a whole lot of sharp cheddar cheese. 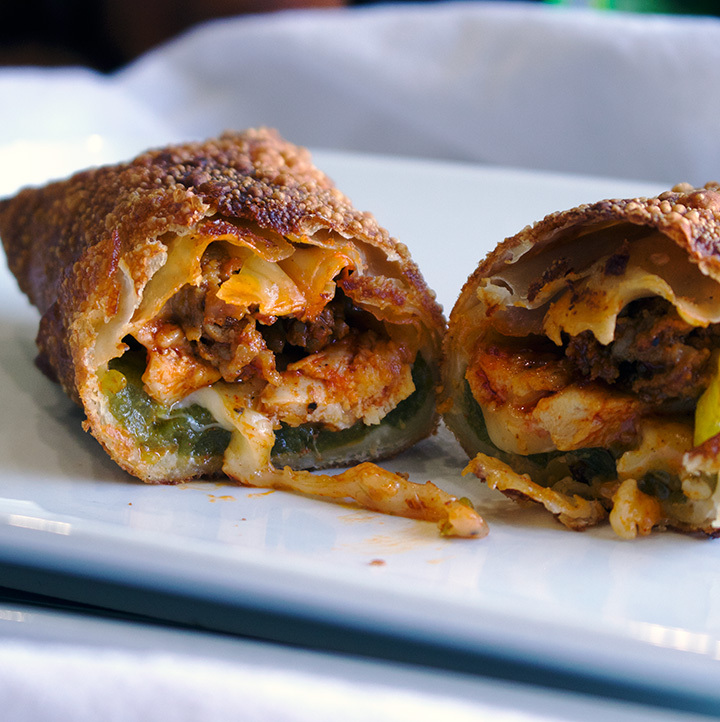 Place a green chili in the center of an egg roll wrapper, then add some cheese, chicken and chorizo. Wrap the whole thing up, then wrap it up again. 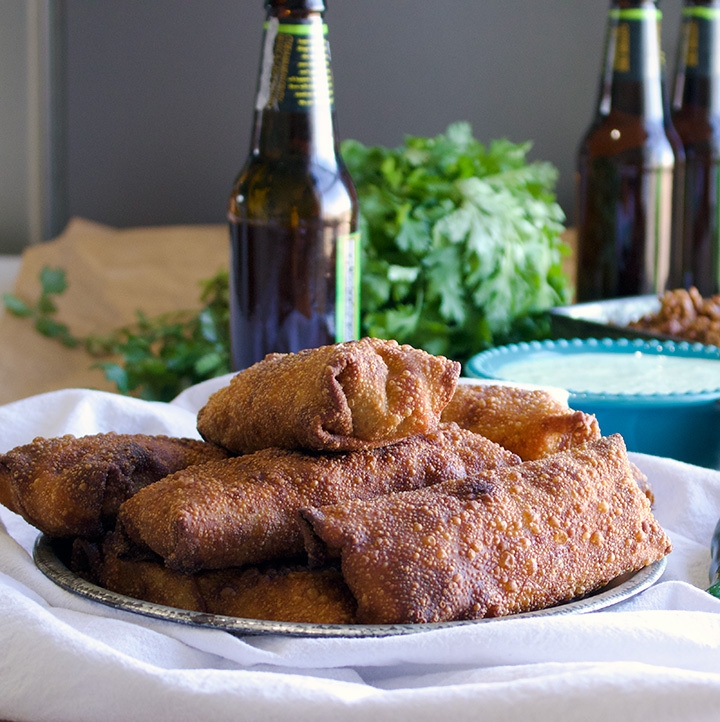 Using 2 egg roll wrappers = extra crispy rellenos. Plus, if you tear the first one wrapping it around all those filling ingredients, it doesn’t matter. You’re going to wrap it again anyway. This stuff couldn’t be easier but packs some serious flavor. Just add some sour cream, lime, cilantro, garlic, cilantro, and a few dashes of jalapeño tobasco sauce, to a food processor, blend it up, and you’re done. Dip or drizzle away. This creation of this recipe was prompted by my entering a recipe contest sponsored by JSL Foods, the maker of Twin Dragon Egg roll Wrappers. You can purchase JSL Foods Twin Dragon products at Albertsons, Shaw’s, Von’s, Stater Bros, Lucky’s, Food Maxx, Fred Meyer, QFC, Cub Foods, Rainbow Foods, Safeway, Associated Stores, Price Rite, Shop Rite, Winco, Price Chopper and Gelson’s. 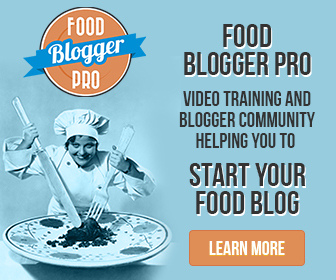 Follow JSL Foods on Facebook and Twitter. It’s really useful when frying anything to have a deep fry/ candy thermometer. If you’re oil is too hot, the egg roll wrappers will burn. If it’s too cool, the egg roll wrappers will absorb too much of the oil while the cook, resulting in greasy chili rellenos. 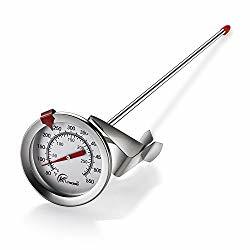 Do your best to keep the temperature of the oil close to 325 degrees when frying; a thermometer will make that much easier. Add all the jalapeño cream ingredients to the bowl of a food processor and process until smooth. Taste and add more salt, pepper, or lime juice if you like. Pour the jalapeño cream sauce into an airtight container and store in the refrigerator until ready to serve. In a small bowl, add the paprika, salt, pepper, brown sugar, and cayenne. Stir to combine. Place the chicken in a 9×13-inch baking dish. Sprinkle the paprika mixture over the chicken and then use your fingers to turn the chicken in the spices, rubbing the spices into all sides of the chicken. Spread the chicken out into an even layer in the baking dish and bake for 25-30 minutes, until there is no pink visible on the inside when you cut into one of the pieces. Leave the chicken in the pan and let sit until cool enough to handle. While the chicken cools, heat olive oil in a skillet set over medium heat. Add the chorizo and use the back of the spoon to break the sausage into small pieces while it cooks. Cook until completely browned – about 3-5 minutes. Use a slotted spoon to remove the sausage from the skillet onto a plate or into a bowl. When the chicken is cool enough to handle, shred it into small pieces inside the baking dish. Stir the shredded chicken around inside the pan to coat it in the pan juices. Get a work surface set up to assemble the chili rellenos: Drain the green chilies and put them in a bowl. Place 20 egg roll wrappers on the counter and cover them with a damp paper towel. Fill a small bowl with water. Set the shredded chicken, cooked chorizo, and grated cheese nearby. Line a baking sheet with parchment paper and set it close by. 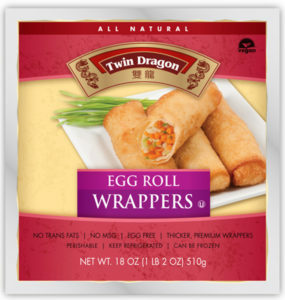 Working with one at a time, lay an egg roll wrapper in front of you. Dip your fingers in the water and brush it along all 4 edges of the egg roll wrapper to dampen. Lay one green chili open and flat in the center of the egg roll wrapper (see pictures above). Add about 3 tablespoons of cheese in the center of the green chili. Top with a few pieces of chicken and a chorizo. Fold the bottom corner of the egg roll wrapper up towards the center. Fold the left side corner up and over the bottom corner and the filling ingredients. Fold the top corner down to the center, then roll the egg roll towards the right corner. Press the seam with your fingers to seal and lay the egg roll on the parchment lined baking sheet. 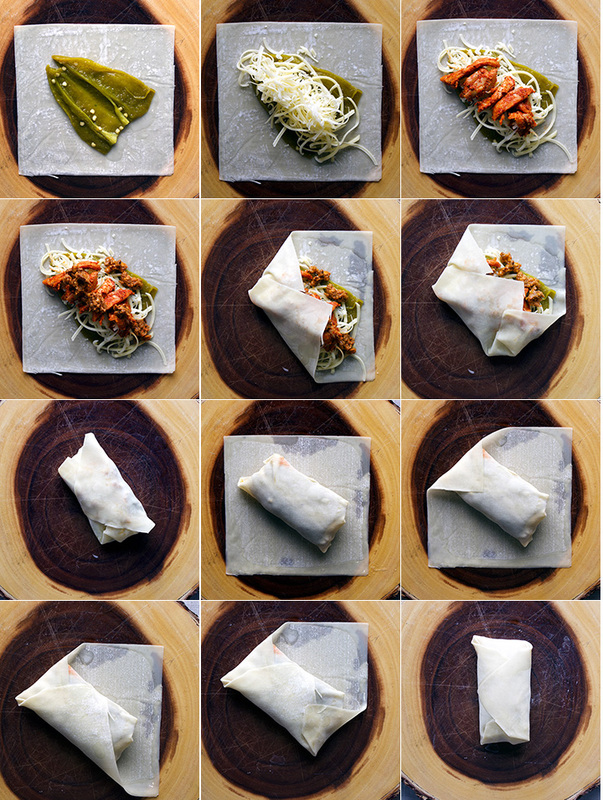 Roll the chili relleno in a second egg roll wrapper and place on the parchment lined baking sheet. Repeat with the remaining egg roll wrappers and filling. Fill a large saucepan with enough oil to come up the sides of the pan about 2 inches and set it over high heat. Heat the oil to 325 degrees. Line a baking sheet with paper towels and set it close by. Using metal tongs, add 3 or 4 rellenos to the hot oil. As they fry, turn them so that they brown on all sides. When the egg rolls are a deep golden brown, use the tongs to remove them from the pan and lay them out on the paper towel lined baking sheet. Repeat with the remaining egg rolls, watching the heat and adjusting the temperature of the burner to keep the oil between 325 – 340. *NOTE: You can keep the cooked chili rellenos warm in a 200 degree oven for up to 1 hour. By posting this recipe I am entering a recipe contest sponsored by JSL Foods, Inc. and am eligible to win prizes associated with the contest. While I was not compensated for my time, I did receive free product samples. As always, all opinions are my own.